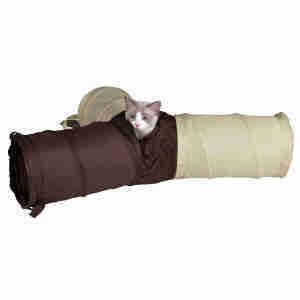 Give your cat their own area to explore with the Trixie Playing Tunnel for cats. The plush tunnel has special rustling foil sewn into it, making it even more exciting for your cat to explore as it rustles as they travel through. Measures 20cm (diameter/height) x 60cm length. I wasn't sure that the tunnel would be large enough for our cats but it certainly is and our cats love using it when they're in a playful mood. Folds up easily when not in use and is good value.